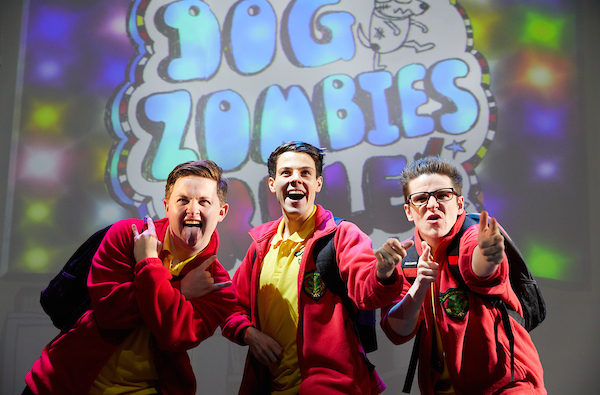 It’s the sort of song that children across the land will dream of singing with their school band in assembly and for Tom Gates and his band, Dog Zombies, the dream has just become a reality! The occasion of this fast food fanciers sing-along was the excellent production of Tom Gates Live On Stage which opened last night at the Bristol Hippodrome and runs until Saturday 23 February. For those who don’t know Tom – and yes, until last night, I was one of that very select band – he’s the star of 15 books by author Liz Pichon, with those books selling eight million copies around the world and being translated into 43 languages! This is the first time, however, our hero and his world has been brought to the stage and my eight year old son – a super Tom Gates fan – and I absolutely loved it. The story starts with Tom in class wondering how he can get rid of some of the sad faces from his report sheet in order to go on the school trip. The thing, Tom isn’t really interested in school – it’s not that he’s naughty, far from it, it’s just that he’d rather be doodling or playing in his band. And this is the charm of Tom Gates. There’s no reliance on David Walliams’ style fart jokes or clichéd evil characters – rather here’s a nice kid just trying to get through the school day and have some fun in the process. Along the way we’re treated to meeting his family – including his so miserable teenage sister Delia, complete with a storm cloud over her head that follows her wherever she goes, his roller skating granny, best mates Derek and Norman, and host of other characters that make up the world of Tom Gates. Throughout the performances are superb, with Matthew Chase relaxed and wonderful in the title role, Ashley Cousins quite infuriating as the annoying Marcus Meldrew and Amy Hargreaves giving just the right degree of ‘angry with everything’ as Delia, complete with all-black ensembles and permanently attached shades. Throughout the action takes place against a variety of wonderfully inventive projected backdrops that take us from Tom’s classroom to his family home, his bedroom, his grandparents care home and several other stops along the way. Mixed in is an ingenious use of animated assets to illustrates the frustrations and thoughts of Tom’s teenage mind. 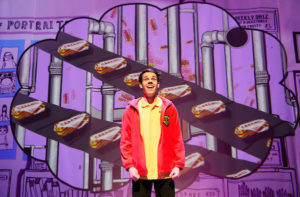 The result is top class family theatre – my son wasn’t alone is laughing along and joining in with the songs – in fact, we were still singing that chips song at breakfast the next morning. All in all, a great half term treat. 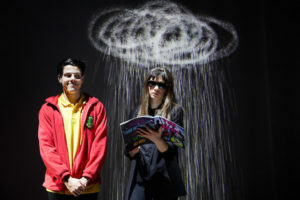 You can still book tickets for Tom Gates Live On Stage! by clicking here! Bristol HippodromeTom GatesTom Gates Live On Stage! Win family tickets to the Bristol Hippodrome pantomime! Competition – win a family ticket to see Gangsta Granny at the Bristol Hippodrome! Competition – win a family ticket to see My Fair Lady at the Bristol Hippodrome!